Our GU trailer is designed with quality materials to ensure you receive the easiest-to-use ATV and UTV hauling experience. With features like a tilt bed and four D-ring tie-down positions, you can be sure that your ATV and UTV will be easy to load and safely secured. Take a look at some additional features below, and be sure to request a quote from your dealer. Dropped aluminum tongue and lower deck height for easier loading and a lower profile on the road. Four D-ring tiedowns conveniently positioned in each corner to allow you to properly secure your load. Fully treated marine grade plywood for durability and superior protection from the elements and backed by a limited lifetime warranty. Shown with options. 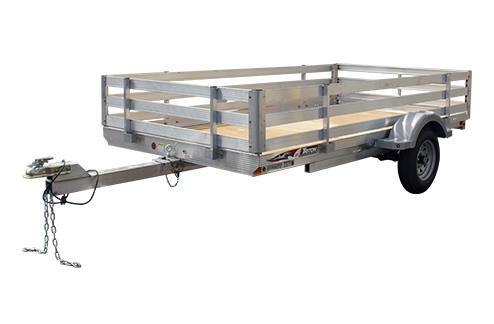 Make sure that the trailer has the carrying capacity and deck space for your specific loads. Recommended tongue weight 7-10% of GVWR. Upgraded tires will change deck heights. Some tire upgrades require spacer kits. Contact your authorized Triton Trailers, LLC dealer for specifications, pricing and lead times. Due to continuous product improvements; standard features, optional accessories and specifications are subject to change without notice or obligation. Triton Trailers, LLC reserves the right to make changes to models or discontinue models without notice or obligation.